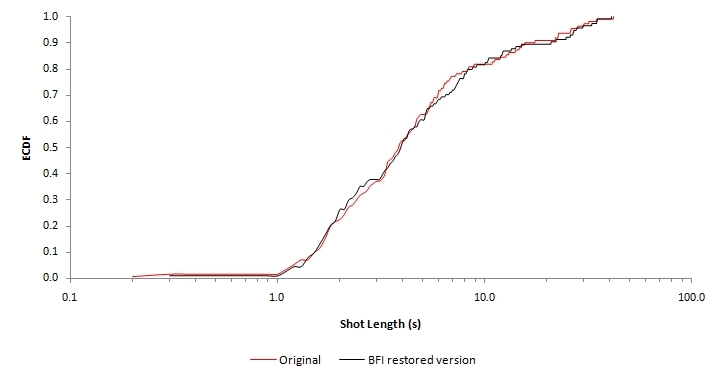 The distribution of shot lengths in a motion picture is an indicator of film style, and is typically positively skewed with a number of outlying data points. Consequently, assumptions about the distribution of data for parametric statistics cannot be met and nonparametric tests are preferred for analysing quantifiable aspects of film style. 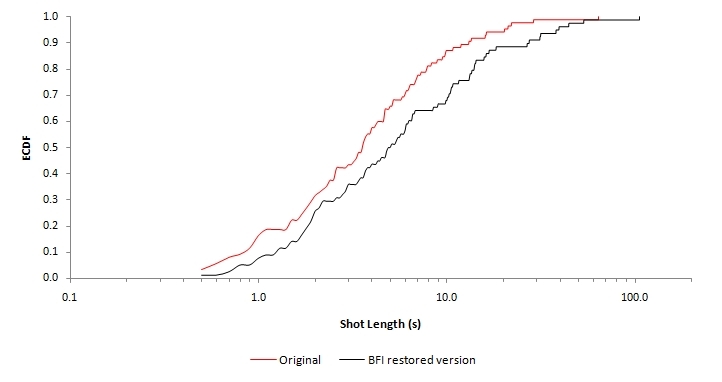 This study uses nonparametric statistics as a method of comparing the distribution of shot lengths in motion pictures. 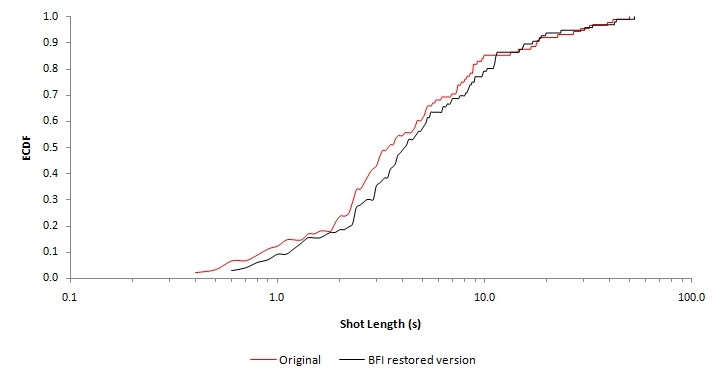 Four films directed by Charles Chaplin from 1914 and 1915 were analysed to determine if the distribution of shot lengths was consistent in the works of a single director over time. 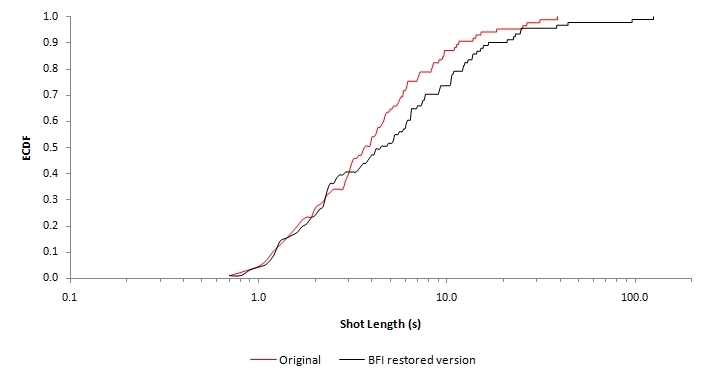 Two sample Kolmogorov-Smirnov tests failed to identify a significant difference in films directed by Chaplin in the same year, but did identify significant differences in films directed by Chaplin in different years. These results may be accounted for by Chaplin’s move from the Keystone Film Company to the Essanay Film Manufacturing Company, suggesting that studio is a determining factor in film style at this stage of Chaplin’s career. I came across a useful paper on interpreting graphs such as the one I use in the above paper, and this is worth reading: Herman Callaert, Nonparametric hypotheses for the two-sample location problem, Journal of Statistics Education 7 (2) 1999: http://www.amstat.org/publications/jse/secure/v7n2/callaert.cfm. I’ve also just noted that there is a paper on the use of non-parametric tests in latest issue of the same journal: dwayne R Derryberry, Sue B Schou, and WJ Connover, Examples: Teaching rank-based tests by emphasizing structural similarities to corresponding parametric tests, Journal of Statistics Education 18 (1) 2010: www.amstat.org/publications/jse/v18n1/derryberry.pdf.